Properties in Viterbo average 4.8 out of 5 stars. 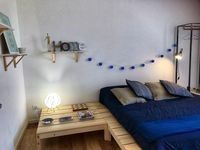 Property 3: La Casetta di Mamma ... your perfect location in Viterbo! Enjoy! Property 9: THE SPA ANCIENT. Property 11: Holiday home in historic building, speed wi-fi free, 1st cat. The apartment in Viterbo was easy to find and a comfortable renovation with an ancient building. The town was quaint and a bit off the beaten track. Restaurants were a bit sparse with unpredictable opening days/hours. We did have a fine meal at O&rsquo;Sarracino a few blocks away. My only negative was, having paid in full six months in advance, with several emails the week before arriving, only to get a &ldquo;it&rsquo;s not possible you have a reservation!&rdquo; from our contact person. Quite disconcerting to say the least. Place was just like the pics, cute place. The host was awesome, left us with plenty of breakfast and information about the town. If ever in town would stay there again . Thanks Laura! !